Rite of Passage or Destructive Emotion? If you go to the library to find some resources on helping your children get over the fear of the dark; you’ll probably be hard pressed to find very much. Although the fear of the dark is said to plague millions of children, it is still a subject that most parents know very little about. Most parents will end up willing to do just about anything after frustration and exhaustion takes over. You hear of children sleeping with their parents for weeks, if not months. Parents hire therapists to help their kids overcome such anxieties and many children are simply left to deal with their fears on their own. While most methods have their validity, some are more effective than others. Whether you’re an involved parent or more of a passive one, spending just a little time to help your kids through this difficult stage can have an impact for their rest of their lives. 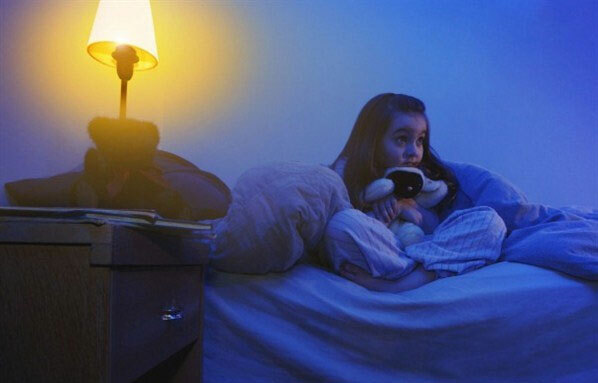 In a simple way, dealing with the fear of the dark is probably one of the earliest fears a child is confronted with. As parents, this is a great opportunity to help them know how to deal with fears in general. Many may argue that this is just a rite of passage for kids, but the fear of the dark lingers into adulthood for thousands of people and it can give rise to other fears. Rites of passage are intended for the betterment of a person, but allowing fear to accumulate over prolonged periods of time and with no boundaries can be the start down a path of destructive emotions. The younger the child, the less that they can separate their fantasies from reality. A simple traumatic experience or an innocent experience taken out of context can haunt a child for years. Being conscious as a parent of your child’s struggle is ultimately going to help determine the outcome of their struggle. Below are ten things you can start doing tonight to give the gift of peaceful sleep to your child. Engage with your child: A firefighter never faced real fire prior to having sufficient training away from the hot zone. Don’t wait till fear strikes before you engage in conversations about fear with your child. Assume that your children will deal with at least one major fear or several growing up so start planning now. What does fear look like in your child? What brings out fearful emotions in them? Finally, how does your child respond when confronted with fear? Identify the triggers: Every child is different and the same goes to how they respond to circumstances and even their own imagination. Does the television in your house spur frightful thoughts, does the tension in your home create undo anxiety in your child or did your child have a traumatic experience that you haven’t made sure that your child is dealing with properly? The better you know your child, the better you can help them through these challenges. Deal with fear properly: The old saying is true that kids will do what you do, not what you say. If you struggle with fear yourself and fail to deal with it properly, more than likely your kids will follow suit. Get some help, identify the triggers and engage a friend or a spouse to help you stay courageous. Your kids will learn more from how you deal with fear than they will reading ten books about it. Declare war on fear: Fear is one of the most destructive emotions your child can give into. Fear keeps people back when they should be moving forward, fear destroys relationships, it hampers personal growth and it can lead people down enslaved paths of destructive emotions. Don’t allow fear to take root in your family. Rid it wherever it claims land in your household and your children will be that much better for it. Rearrange the room: Often times a simple rearrangement can mean all the difference to a child struggling with the shadows and strange sounds of a dark night. Cutting branches away from the window, getting darker shades, closing the closet, facing the bed away from the moonlight are just a few practical ideas. Enjoy the night: There are thousands of nighttime wonders to fascinate a child rather than simply being afraid of it. Our world has so much beauty that we often take for granted what darkness actually reveals. We tend to think in terms of what darkness hides, but that reality is that darkness opens up a whole new world of glowing insects, nocturnal animals, shooting stars and the wonderful moonlight glow. Take time to introduce your child to a few of these so they can gain appreciation for the night instead of only being afraid of it. Find a hero: Find someone that your children can esteem because of their bravery. We all face fear in our lives, but not all people are courageous. Read examples of men and women who have done brave things despite their fears and remind your children of such stories. Even children can rise to bravery and courage when faced with an example to live up to. Slow down: Many parents are so busy dealing with their own problems that they fail to see that their children are going through the same, if not a myriad of their own struggles. Don’t just assume they’ll work it out, slow your life down to see the details. A well said conversation at the right time can make all the difference and give your child the strength to take on bigger challenges throughout life. Speak to their identity: Don’t make light of your child’s fear and put them down for it, but rather focus on times that they are strong. When you say things like “Wow, that was brave,” or “I noticed how strong you were;” you’ve just given your children an upgrade on their armor and they’re ready to meet the next big challenge in their life. Children have enough chiseling at their confidence outside their home, the last thing they need is an unsupportive parent. Don’t give up: Our kids are some of the greatest investments we have in life, therefore the effort is worth the payoff. Kids often go through cycles of fear as they face different challenges in life and their imagination grows stronger with age. This typically isn’t a one night deal where you’ve conquered fear and it will never rear its ugly head again. Learn to keep watch on important milestones that your child is approaching as new fears or old resurrected ones like to visit again. Chad Cramer has a bachelor’s degree in business management from Cornerstone University in Grand Rapids, Mich. He currently works for a software company, and is a member of Woodmen Valley Chapel Church in Colorado Springs. In his spare time, Chad enjoys spending time outdoors with his wife and four sons. He has recently published “Lights Out! : Helping Your Kids Overcome Their Fear of the Dark,” a guide for parents in helping their children overcome their fears.